The record label, You Are The Cosmos, offers us the second part of the excellent work of Ronnie D'Addario by way of a vinyl LP, with the best of his lastest works so far--that is to say from 1986 to 2017, plus a box set of three CDs that include the three albums he recorded during that time. For those who sampled the magnificent previous compilation,“First Years” (1976 - 1983), you will, no doubt once again, admire this impressive continuation. Anyone with a minimum of sensitivity will agree that this composer, lyricist, multi-instrumentalist, etc. should figure in the encyclopedic annals of the best rock and roll of all time. His fascinating musical universe is full of magnificent songs that comprise multiple styles; certainly impressive both melodically and rhythmically. With the emotional and sensual elements of the best pop, D'Addario dresses his compositional wonders with great arrangements ranging from powerpop to blues, country, soul or rock, always hitting the mark, be it a ballad or more energetic and danceable rhythm. Each and every one of his songs are exquisite, full of nuances, composed with humility and conviction, with a force and delicacy worthy of the greatest composers and performers of pop. You Are The Cosmos has already released the albums, "Take In A Show" (1976), "Falling For Love" (1981), and "Good For You" (1983) plus Bonus Tracks as part of a 3CD Box Set. A total of forty songs of which 12 were chosen for the vinyl "Best Of" 1976 - 1983. The discs and vinyl include the lyrics of the songs. Now, the power pop label based in Spain, has released his three most recent albums: "The Many Moods of Papa Twig" (2017), "A Very Short Dream" (2015), and "Time Will Tell On You" (1993). A total of 47 songs, plus 4 bonus tracks, of which 12 were chosen for a vinyl "Best of 1986 - 2017". Both in the Box Set and in the LP, you again have at your disposal, the lyrics of all the songs. Among the credits are the names of those who have collaborated on certain cuts, in one form or another, either by providing vocals such as his sons Michael and Brian of the Lemon Twigs, Bob Mastro on Pedal Steel, mandolin, and violin; Nick Lohri on guitar, Robert Sole on bass, Glen Robert Allen on drums; Providing lead vocal on "Cute To Boot" is Jan Melchoir with Judy Dunleavy. On "After Me Own Heart" is Mary O'Dowd. The Dublin Bay Pirates help out with Irish instrumentation on "In Time". The excellent photos on the front and back cover of the compilation, and on "The Many Moods Of Papa Twig" were taken by Jackie Zeankowski. "Best Of" opens with "Time Will Tell On You", the first of the melodic wonders in which the jangly 12 string guitars give way to a sensational lead vocal. Remarkable also is the rhythmic approach supplied on bass and drums. Each and every one of the instruments are integrated with an exhibition of nuances that play with the tempos and grow in strength. The brilliant harmonies display both technique and feeling. Next is "A Very Short Dream", another exquisite song articulated with a plaintive piano and angelic voice, shrinking the heart with each chord and lyrical reflection, arpeggio guitar riffs, strings, and meticulous percussion, plus those indispensable backround voices. What follows is "She Tries". Beginning with a classical piano that draws ethereal figures, Ronnie treats us to yet another simply stunning pop song. His sons sing some key phrases here and the blend is wonderful. Enter a throbbing drum beat and bass slide into "Don’t Wait For Yesterday" which happens to be the title of the 3CD box set. Beautiful vocal combinations shake us from beginning to end. A new wave feel and a percussive organ solo complete a song that will give you goosebumps and passion in abundance. The personal "My Old Self Again" pulsates with melody and fluency served up with a wistful psychedelia 60's piano feel. The perfect multiple counterpoint voices of his children soar in the choruses, topped off with celestial orchestrations. "Get It Right" closes Side A, exhibiting compositional excellence for the umteenth time. Acapella vocal harmony leads to danceable rhythms in which electric piano, and percussion clothe this simply unbeatable voice. He astonishes us once again, with a scrupulous mastery of tempo and intensity that brings this tune to the point of being unstoppable. Side Two kicks off with the sensuality of "So That's How It Is", a theme that reaffirms his innate ability to create beautiful songs with perfectly voiced arrangements with special attention to detail. Voice and piano come right in, then it's onto some rhythmic changes and a fine guitar solo. Everything, including the tender voice of the earnest questioner, is designed to create some very special moments. He then captures us with "Don’t Get Me Started," a sensational amalgam of catchy phrases leading off with piano and irristable rhythmic patterns--A tune that takes off in an unprecedented melodic flight. Upon hearing, your heart will beat with shear delight allowing you an incomparable perception of the poetic and sonorous space of this great composer. With "The Walking Wounded", D'Addario offers us even more examples of greatness, both musical and poetic. A song that somewhat defends love at all costs, regardless of fears, even if the battle is lost. Consistent, seemingly effortless creativity that continues with imperturbable security. With "Heroes Are So Easily Replaced," he encourages us to keep our feet on the ground. Give your heart, but don’t lose your identity--A demonstration of some good ideas to impart in the form of a warning. A song that shifts between power pop guitars and subtle keyboard fills and pads, ending in a succession of captivating, compelling chorusus. The extraordinary "She Is Something"; a theme of love in which the protagonist wants to arouse the interest of a special girl. A theme of wry emotion, driven by a piano that accompanys the dreamy voice of Ronnie--"really something". The album finishes with "Love's Won Me Over", one last surprise of this magnificent selection of songs. In this case, we find a subtle theme of pop soul with sublime arrangements of keyboards that give off enchanting sound ripples that accompany the unsurpassed voice of it’s inspired composer. Exquisite vocal harmonies abound, all sung by Ronnie. To paraphrase the title of the last song, Ronnie D'Addario has completely "won" us over. Undoubtly, a desired victory for all discriminating listeners--those of you with good musical judgment. I reckon that selecting songs for a compilation is always an arduous task in the case of authors as prolific as Ronnie D'Addario. He is, of course, an excellent composer, as well as an unbeatable singer and instrumentalist. There is not a single one out of all those songs that does not deserve to be among the best of the best. Without any discussion, I am convinced that we could use more than one compilation. "Best of 1986 - 2017"--What must have been the extraordinary criterion used by YATC to make the difficult decision of choosing only twelve songs?--Twelve memorable and essential tracks out of all of this artist’s excellent work. Lucky for us, the rest of the songs on these three most recent albums, are included in the magnificent 3CD box-set, “Don’t Wait For Yesterday.” A collection containing a half hundred songs. The master D'Addario will pleasently surprise you with multiple stylistic recordings that make up a composite universe full of pure melodic delicacy, fun, and highly emotional moments, all absolutely sensational and essential. I am not talking here about a simple recommendation. In this review I am telling you, in case you still have doubts about whether or not you should acquire these discs, that if you listen to this wonderful work, you will never be able to get along without it. I assure you that your conception of pop will not only evolve considerably, but you shall come to realize how silly we are, trying to sift through the mass media searching for gold, when we have within reach authentic masters like Ronnie D'Addario. Note: You can purchase a copy of the vinyl and 3CD Box Set at www.youarethecosmos.com outside of the USA. Go to www.ronniedaddario.com to purchase in the USA. Videos and more information also available on the RD website. When one hears for the first time the fabulous songs that Ronnie D'Addario wrote and recorded between 1976 and 1983, he thinks, “How it is possible that this artist has escaped him.” Fortunately, our much-loved You Are The Cosmos label remedied this unforgivable oversight by recently releasing a vinyl compilation of twelve monumental songs by this astonishing yet unknown artist. "Best Of Ronnie D'Addario 1976-1983" begins with harmonies worthy of the Beach Boys. In his song, "Wait in the Wings" Ronnie performs the multiple voices and all of the instruments. This album of twelve jewels demand obligatory listening. It is incomprehensible that Ronnie did not become world famous with such material. In some cases paths crossed: The Carpenters were going to release the monumental "Falling For Love," but the death of Karen Carpenter derailed the project. Ronnie D'Addario ended up becoming one of the best kept secrets in pop that this essential compilation has now revealed to us. By the way, Ronnie is the father of the successful duo, The Lemon Twigs, but today in Viniland, we wish to claim the father. An anthology makes it possible to discover the little-known work of Ronnie D'Addario, the daddy of Michael and Brian, Aka The Lemon Twigs. “First Songs” is a collection of melodies recorded in the 70s and 80s, which should delight Paul McCartney fans. The archeology of the populace is full of diverse and appalling examples of conflicting and pathological relationships between fathers and their sons. The rebels are sowed with frustrated and invasive Pygmalion dads--Murry Wilson and The Beach Boys, Tim and Jeff Buckley, John and Julian Lennon. They turn out to be amazing musicians, even with the mistreatment or absence of their fathers. It’s a comfort to know that the same results are achieved with encouragement and kindness. 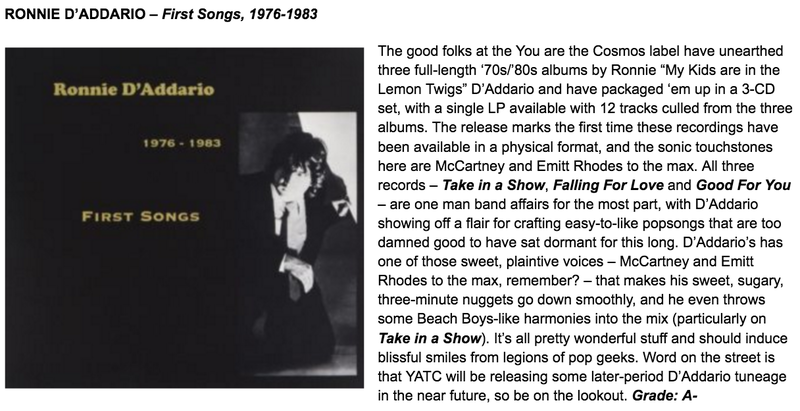 Ronnie D’Addario became known when Michael and Brian Aka The Lemon Twigs started delighting pop retro music fans. It was through their first interviews, where the sons mentioned his musical influence on them, that listeners started seeking him out and listening to his music. Loving and enlivening to their ear, a few enlightened and noteworthy observers have now exhumed a veritable musical treasure that remained buried for more than thirty years within the walls of the family home. There, the dad mentored, with careful attention, the ascending careers of his two offspring. 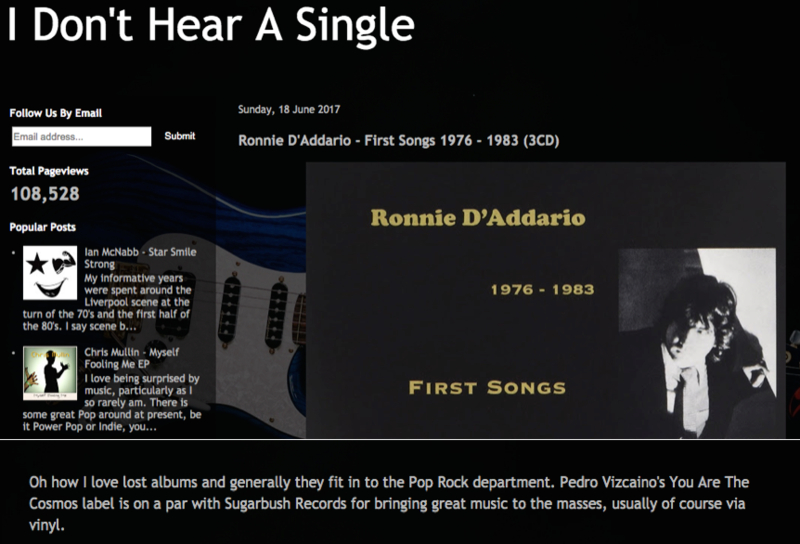 Ronnie D’Addario has released three albums now available on the excellent Spanish powerpop label, “You Are The Cosmos” Records. From 1972 to 75, he began a professional career as a guitarist and bass player. In 1976, he took charge of his own destiny, buying equipment, and recording himself. The result--his first album, “Take In A Show”-- with it’s bouncing rhythms and smooth harmonies so familiar to fans of the Beatles. The influence of Paul McCartney is omnipresent without becoming invasive. Five years later, this gifted disciple has a little access to deserved recognition, when in 1981, he composes “Falling For Love,” which gets recorded by The Carpenters, the flagship duo of American mainstream records. This project remains unfortunately in the vaults of A&M Records. Ronnie’s version of the title song remains one of the highlights of his second album. A third album followed shortly thereafter--“Good For You,” equally as excellent. D’Addario senior has spent the last two decades raising a family, somewhat withdrawing from a scene that refused to grant him his dream. However he never stopped writing and recording or playing concerts and clubs. Thirty years later, I happily caught up with his grateful progeny who continue to let us know that behind this good father is a great talent. "Ronnie D'Addario has written and produced a delightful children's album. Although children will respond to the music and rhythms, this is also a family CD. The lyrics are especially supportive of basic principles of living with others that parents try to instill in their children. The songs reinforce these principles. "Mine," for example, addresses sharing of toys. All of the texts address issues in the comfort zone of everyday living. The music is truly engaging and wonderfully well performed." "First rate children's album. Catchy melodies and clever lyrics will engage the parents as well as the kids." "Music and lyrics are truly beautiful, soothing, witty, and should prove to be very popular with little ones." "Well-sung, well-crafted lyrics gently and knowledgeably give voice to children's concerns, everyday experiences and discoveries. D'Addario's lullaby is one of the loveliest I've heard." "Themes: bedtime, the playground, sharing, concepts, etc. Often message driven. "Bicycles Everywhere" tells us that "more bikes and less pollution are needed, to a tune that perfectly imitates the feeling of a lazy Sunday bike ride. "Our Town Music Store" will be a welcome addition to any librarian's programming box, with it's opportunities for participation and repetition. Teachers may find "Opposites and Rhymes" a useful way to introduce those concepts. This pleasent album will make a fine additional purchase for music collections." Ronnie D’Addario – whose Best Of 1976-1983 LP is out now on You Are The Cosmos – could be the greatest songwriter no one ever heard. He’s the dad of brothers Brian and Michael D’Addario, from New York hipsters The Lemon Twigs, and sublime Beachboys and Beatles-inspired pop is his specialty. And there’s plenty of it on offer on this classy 12-track compilation.